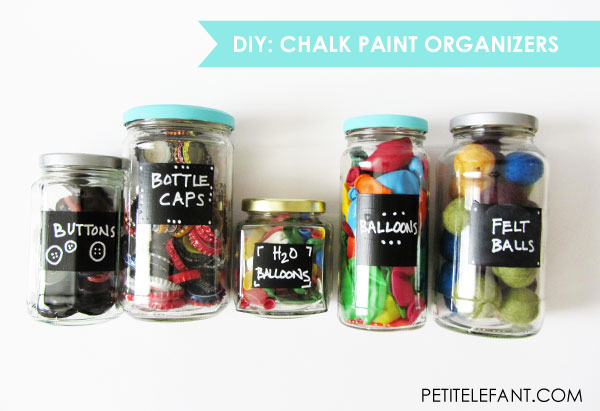 A DIY Tutorial for chalk paint organizers, yes? Yes. YES. Hi, my name is Stephanie, and I’m a craft-aholic. I’m constantly accumulating craft supplies or little trinkets that I think could have great crafting potential and DIY tutorial potential (hello bottle caps, corks, and old sweaters). I store my craft supplies on a book shelf in my bedroom, and what were once five nicely organized shelves of a few pieces of fabric, a couple spools of thread, and a craft book or two has become a monstrosity of felt, sequins, jars, scissors, buttons, paints, brushes, bottle caps, and any other craft supplies you could possibly think of. Well, it’s time for the madness to stop! I need some order in my craft bookshelf, and I’m sharing with you one of the tutorials of solutions I have come up with to help organize the chaos, and of course it is in on par with most of my other projects: up-cycling every day items you already have laying around the house! 2. Priming the lids with a coat of white spray paint helps mask out the original color of the lids and will make your life a lot easier when it comes to painting them. 3. 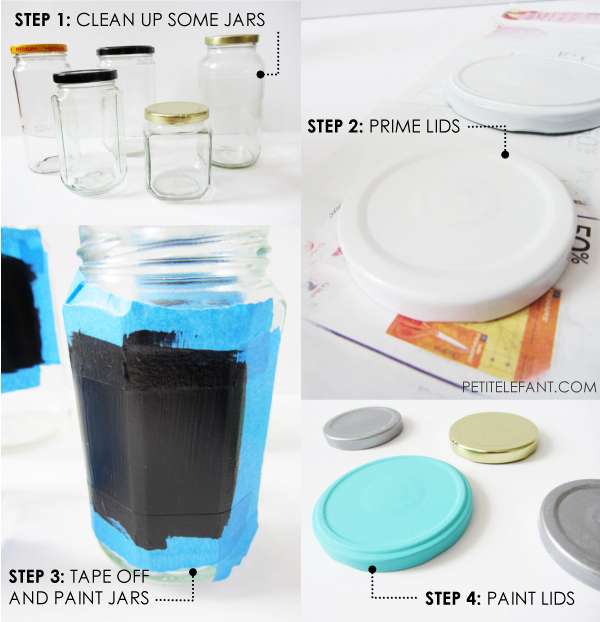 Tape off each jar to the shape you want for the label and then paint it with the chalk board paint. It took a few coats for me to get a good covering. Let it dry completely before removing the tape. 4. After the primer is dry, paint the lids with your choice of acrylic paint. 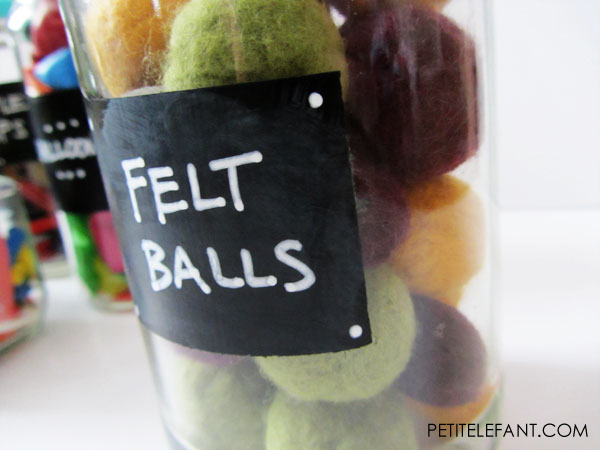 After the tape is removed, fill up your new organizing jars and label accordingly. I used this chalk pen to write my labels which worked wonderfully. It was definitely easier to work with than regular chalk and easily cleaned off with a damp cloth. I’m thinking I’ll be making some more of these as I get more glass jars. What will you put in your new organizers? 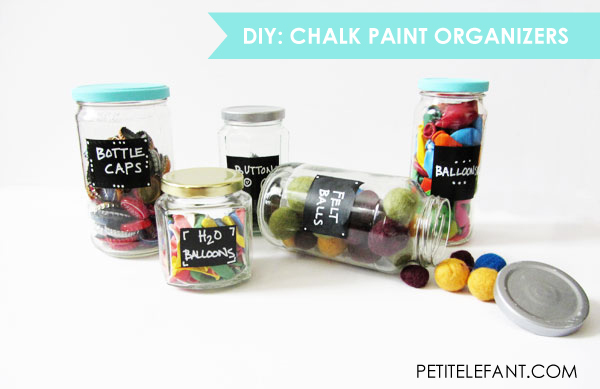 Do you love DIY tutorials with chalk? I’m obsessed! What have you made? A designer, maker, crafter, and blogger, Stephanie Hayward spends her days designing buildings in Columbus, Ohio and nights blogging about design, DIY, and (attempts at making) good food at Stuff Steph Does. She lives with her partner in crime, Brandon, and their spunky little dog, Lucy. These look super fun to make. I’m gonna hafta try them! I really enjoy your ideas. My 7 year old daughter was just assigned a science project and I was wondering if you have any ideas. We have to use recyclable items around the house (cans, bottles, jars) to create a little person.I stopped at CVS this morning and picked up a little craft kit with popsicle sticks, stickers and stuff to get started. I am terrible at crafts so any ideas you may have would be great.